Kuang Si Waterfall, or Tat Kuang Si, is probably the most popular tourist attraction for a day or half-day trip from Luang Prabang. 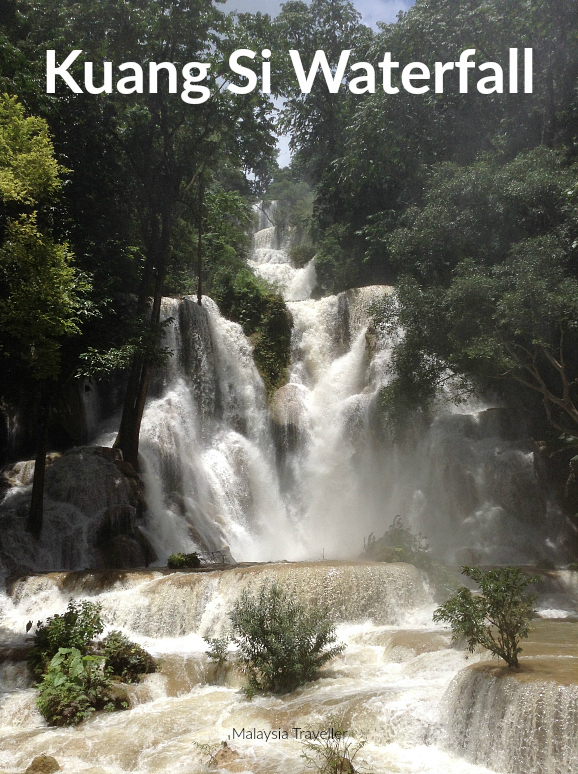 The waterfall, sometimes spelt Kouang Si, is located at Ban Thapene village around 26 km from Luang Prabang and any number of tour operators or tuk-tuk drivers will happily take you there. 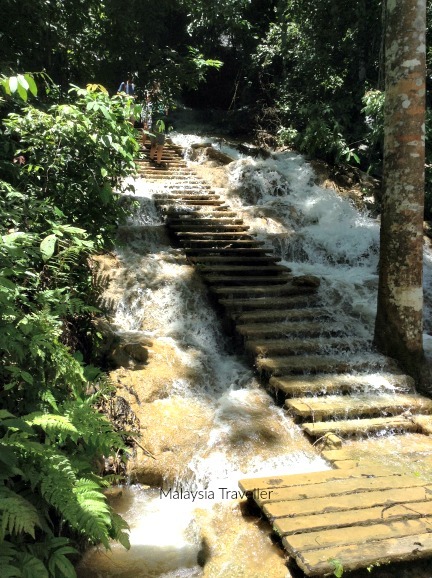 It is certainly a spectacular waterfall, tumbling through multiple tiers with the main cascade being around 50-60 metres high. It is busy with both foreign tourists and locals, especially in the afternoon, who come to picnic, bathe in one of the three swimming holes or just soak up the positive energy created by the falls. 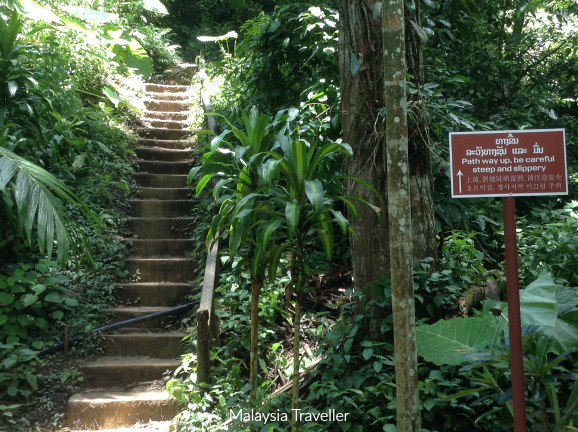 From the entrance it is about 10 - 15 minutes walk to the main waterfall viewpoint. If you still have energy you can take a trail for a further 2 km to the water source and cave. This involves walking on steps which are semi-submerged. Since they looked slippery and I only had one pair of shoes I turned back at this point. There is another trekking trail on the other side of the river which is recommended only in the dry season. This sanctuary is run by Free The Bears, a charity formed in Australia to rescue Asiatic Black bears, Moon bears and other bears from bear bile farms or from being butchered for bear paw soup and other cruelties in Laos and other countries. 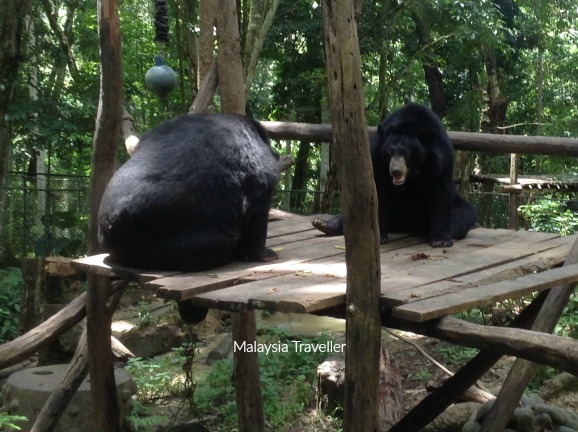 The sanctuary at Kuang Si was started in 2003 and has since been expanded into a Forest & Wildlife Discovery Trail to help educate the public on the need to value bears as part of the natural environment. 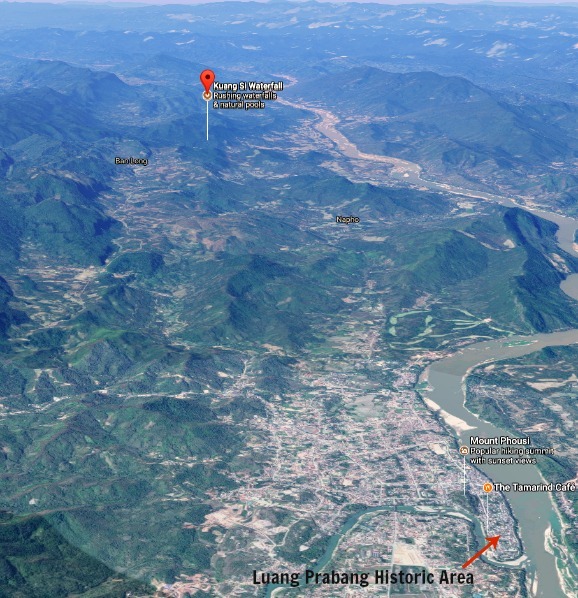 Through their advocacy efforts the Luang Prabang bear bile farm was ordered closed in 2011. Here you can see the bears at play and at rest (mostly sleeping) and you can buy T-shirts and other Free The Bears merchandise to support the charity’s good work. It is open from 8am to 5.30 pm. Entrance for non-Laos costs Kip 20,000 (about $2.40). There are toilets, changing rooms and several picnic areas. 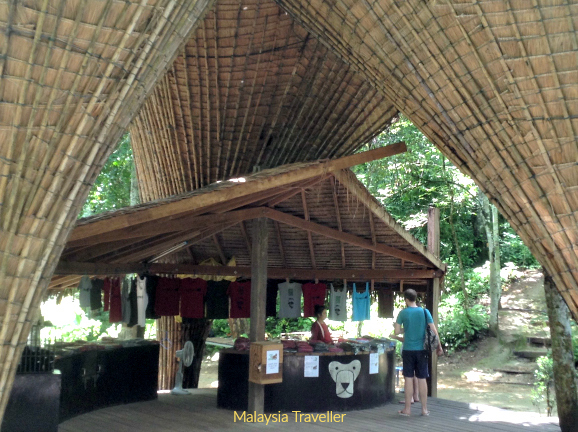 There is a restaurant near the falls which can supply you with cooked food or BBQ supplies to cook your own meal. 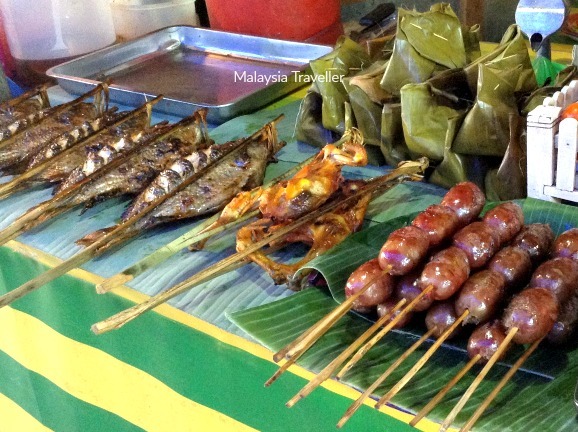 Outside the entrance to the park, where all the cars and tuk-tuks wait, are a number of rood stalls specialising in charcoal grilled fish, meats and sausages. Organised tours with guide and transport from Luang Prabang can cost $50 per person and up, though there are definitely cheaper ones around. We just hired a mini-van and driver who charged Kip 200,000 ($24) for the round trip and including his waiting time while we explored the falls. Tuk-tuks can probably be negotiated at a lower price. We saw some people who cycled all the way there and back. The scenery is nice and the traffic is light. Sounds great but it is a 50 km round trip with lots of ups and downs. Plenty of water and sun protection would be needed. A motorbike might be more sensible. 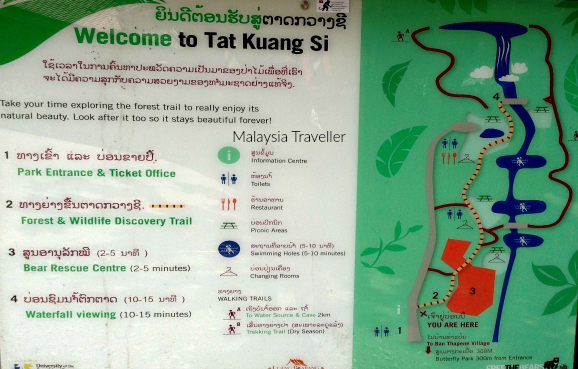 There is a Butterfly Park around 300 m from the entrance if you want to combine this with your trip.